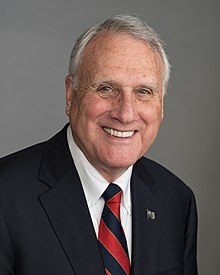 Jon Llewellyn Kyl (born April 25, 1942) is an American politician. He served as the United States Senator from Arizona from September 2018 to December 2018 after the death of John McCain. He is a member of the Republican Party. He was in the United States House of Representatives from 1987 to 1995. Before his 2018 appointment, Kyle served in the United States Senate from January 3, 1995, to January 3, 2013. He was the senate Republican party whip from 2007 until 2013. Kyl was born on April 25, 1942 in Oakland, Nebraska. He was the son of John Henry Kyl, a Republican congressman from Iowa. In 1964 he graduated from the University of Arizona with a bachelor's degree in political science. In 1966 Kyle graduated Phi Beta Kappa from the University of Arizona's James E. Rogers College of Law. He was editor-in-chief of the school's law review. In 1966 Kyle joined the Phoenix, Arizona law firm of Jennings, Strouss, and Salmon. In 1985, he was a member of the Phoenix Chamber of Commerce. He is married to Caryll Collins. They have two children and several grandchildren. In September 2018, Kyl was appointed by Governor Doug Ducey to serve in the Senate seat left empty by the death of John McCain. He retired from the Senate on December 31, 2018. ↑ 1.0 1.1 1.2 "Kyl, Jon Llewellyn". Office of Art and Archives and Office of the Historian, The United States Congress. Retrieved July 19, 2015. ↑ 2.0 2.1 2.2 2.3 2.4 2.5 Danielle Burton (27 November 2007). "10 Things You Didn't Know About Jon Kyl". US News & World Review. Retrieved 19 July 2015. ↑ Joan Koerber-Walker (15 October 2012). "AZBio To Honor US Senator Jon Kyl at AZBio Awards". Arizona Bioindustry Association, Inc. Retrieved 19 July 2015. ↑ "Former U.S. Sen. Jon Kyl will be John McCain's successor in the U.S. Senate". Arizona Republic. September 4, 2018. ↑ "Jon Kyl, Former Senator, Will Replace McCain in Arizona". New York Times. September 4, 2018. ↑ Wingett Sanchez, Yvonne (December 14, 2018). "Jon Kyl will resign from the U.S. Senate on Dec. 31, setting up another appointment by Ducey to John McCain's seat". AZ Central. Retrieved December 14, 2018. Wikimedia Commons has media related to Jon Kyl. This page was last changed on 3 January 2019, at 21:46.